June 24, 2012 by Alphageek in "alphageek", "shopping"
Today is yet another product review. 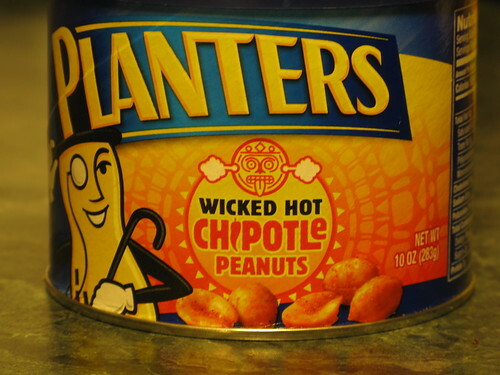 Up today are Planters Wicked Hot Chipotle Peanuts. I purchased these peanuts somewhere or other, thinking these would be great peanuts, and the review would make a great addition to the site. One of these ideas was correct. The can opens innocently enough, like any other can of peanuts. I noted that the peanuts are dusted with some flavor powder, where all of the seasoning should be. I was drawn in by the Wicked Hot description in the title. The alphageek likes spicy food, and flavored nuts are a great delivery system for the heat component. I took a couple of the peanuts, and crunched down, waiting for the explosion of heat. That explosion never came. Instead, it was like being a kid and setting off some firecrackers that never go off. I hoped that I could just have another, and the heat would kick in, sort of like when you can just light some more firecrackers, and get that noise that you are looking for. I never really got the bang out of these peanuts, that they promised. There is even a face with steam or smoke or something coming out of its ears, right on front. I certainly did not get that. What did I get? I got a product that had a very sweet taste. Sure, there was a small heat component, but I got mostly sweet. It was a synthetic sweet at that, combined with some sort of synthetic tasting smoke flavor that only served to remind me that I did not get the Wicked Hot promised on the label. Usually, peanuts are something that don't last long here at alphageek headquarters. I like to chomp a few down when I arrive home from work, but these have been open over a month, and the can is still half full. My thoughts are that this is a pretty weak flavor profile, and you should stick with the standard Planters Peanuts, which have stood the test of time as a solid snack food, and stay away from the trendy product.